Blocks Back Pain: Relieves tough back pain. 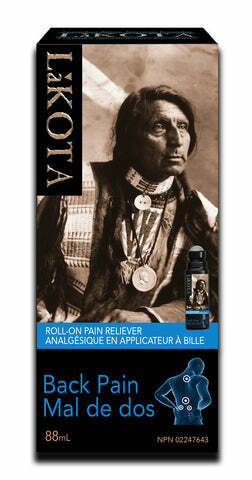 Back Pain Roll-on is odourless, non-greasy, and works quickly. Penetrating deep into the muscle, Lakota blocks back pain signals at the source. Provides effective relief of pain associated with muscle spasm such as back pain, tense neck muscles, strains, and sprains. Non-medicinal Purified water, Carbomer, Germaben II, Triethanolamine. Consult a health care practitioner if symptoms worsen. Transient skin irritation, burning sensation, stinging or redness are part of the normal, expected action. If experienced, do not get wet, use ice wrapped in a towel for cooling sensation. Usually diminish after repeated application. Cautions: Avoid applying to injured or broken skin. Adults: Apply 3 to 4 times daily, directly to the sore area. Cover the area completely. Use for at least 1 week for maximum effectiveness.